Though he played many important roles over the course of his 60-year career, Quinn's signature character was Zorba, a zesty Greek peasant who teaches a stuffy British writer to find joy in the subtle intricacies of everyday life in Zorba the Greek (1964), which Quinn also produced. 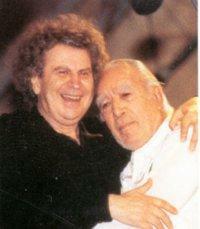 The role won him an Oscar nomination and he reprised variations of Zorba in several subsequent roles. Although he made a convincing Greek, Quinn was actually of Irish-Mexican extraction. 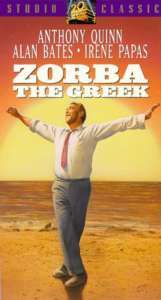 Zorba The Greek: This movie turned Anthony Quinn into a Greek forever. Based on the book by Nikos Kazantzakis (which should be read by everyone who feels that life is passing them by) it also stars Alan Bates whose character has inherited a lignite mine somewhere in Crete and meets the free-spirited Alexis Zorba in a cafeneon in Pireaus. Zorba convinces Bates to hire him to run his mine. Filmed in black and white the movie documents a Greece that has almost completely disappeared. With an inspiring soundtrack by Theodorakis (the best work he has ever done) and the greatest performance of Anthony Quinn's career. Nearly 20 years later, he reprised "Zorba! ", this time in a 1983 revival of the Broadway musical which reunited him with both Kedrova and the film's writer-director Michael Cacoyannis. He earned a Tony nomination for his efforts before touring the USA from 1983-86, forever stamping the part as his in the minds of the theatergoing public. The Guns of Navarone: As a big fan of the town of Pylos where this movie supposedly takes place I have a warm spot in my heart for it. It stars Gregory Peck, David Niven and Anthony Quinn plays himself playing Zorba. The story is about a bunch of commandos in the Second World War who team up with some Greek resistance to blow up these guns that have been sinking allied ships, or something like that. I don't think the guns ever existed in case you plan to go to Pylos (Navarino) to find them. 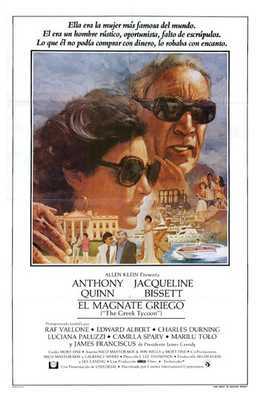 The Greek Tycoon: Anthony Quinn dusts off his Zorba character for one more run, this time as a Greek millionaire based on Aristotle Onassis. When they were making this movie every young Athenian actor, model or person with a face raced off to wherever they were filming this to get a role, believing this would be their big break. After he weighed in with his Aristotle Onassis impersonation in "The Greek Tycoon" (1978) and Anthony Quinn later portrayed the shipping magnate's father in "The Richest Man in the World: The Aristotle Onassis Story" (ABC, 1988), for which he received an Emmy nomination. 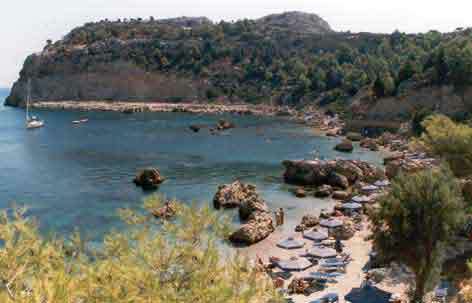 The small bay of Anthony Quinn with crystal clear waters and rocky surroundings is one of the most beatifull beaches on the island of Rhodes. The beach is know today by the actor's name, since filming the Guns Of Navarone here. Enjoy your visit, and if you have any suggestions, comments, or questions, feel free to e-mail me at info @ anthonyquinn .org and I'll do my best to answer in a timely manner. If you would like to be informed each time this site is updated, join the site mailing list.